Click on the image above to view the trailer for Far East of Eden. 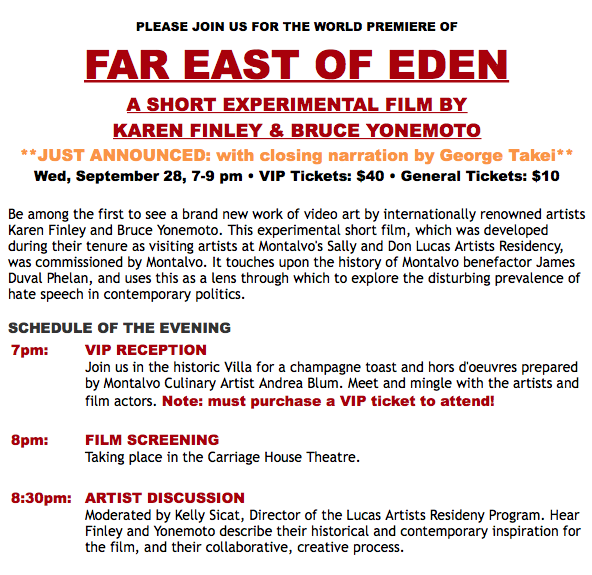 SARATOGA, Calif. — Montalvo Arts Center is pleased to announce that on Wednesday, September 28, 2016 it will present the world premiere of an experimental short film by internationally recognized artists Karen Finley and Bruce Yonemoto: Far East of Eden. The work, which was developed by Finley and Yonemoto during their tenure as visiting artists at Montalvo's Sally and Don Lucas Artists Residency earlier this year, was commissioned by Montalvo. It uses a dark chapter of California history as a lens through which to explore the disturbing prevalence of hate speech in contemporary politics and its potential dangerous consequences. The screening will take place at 8pm in Montalvo’s Carriage House Theatre and will include a panel discussion with the artists (tickets: $10). A VIP reception featuring wine, hors d'oeuvres, and a chance to mingle with film actors and project sponsors will precede the screening at 7pm (tickets: $40, include access to the screening and discussion). Far East of Eden draws on the story of Senator James Duval Phelan, three-time mayor of San Francisco and the first popularly elected California Senator. In 1912, Phelan built Villa Montalvo as his country estate in Saratoga, California. Villa Montalvo was Senator Phelan's favorite home and a center of artistic, political, and social life in Northern California. Upon his death in 1930, Phelan bequeathed the Villa and surrounding property as a public park, asking that they be used “as far as possible for the development of art, literature, music, and architecture by promising students.” Decades later, this would become Montalvo Arts Center. Far East of Eden is one of two works of art commissioned by Montalvo in 2016 that interrogate issues of inclusion and exclusion in Silicon Valley. The other is Rolling Counterpoint, an installation by Japanese-born artist Taro Hattori. Inspired by the Japanese tradition of using tea houses as spaces for mediated discussion, Hattori will hold public conversations in Rolling Counterpoint through the fall and winter, addressing the specific history and current social environment of Silicon Valley, addressing issues of displacement. The piece is installed on Montalvo grounds and will have a roving counterpart that visits various locations throughout the Bay Area. A schedule of upcoming locations and dates will be released soon on montalvoarts.org. Bruce Yonemoto has developed a body of work that positions itself within the overlapping intersections of art and commerce, of the gallery world and the cinema screen. As a "hyphenated American" (Japanese-American), he has a special interest in literature (anthropological, fictional, travel) that explores areas where people geographically and historically separated come into contact with each other and establish ongoing relations. These contact zones have been historically rife with coercion, radical inequality, and violent conflict. Yonemoto has been honored with numerous awards and grants from the National Endowment for the Arts, the American Film Institute, the Rockefeller Foundation, and the Maya Deren Award for Experimental Film and Video. Most recently, his solo installations, photographs, and sculptures have been featured in major one-person shows at the ICC in Tokyo, the ICA in Philadelphia, and the Kemper Museum in Kansas City. The Tate Modern in London will mount a retrospective of Yonemoto's work in 2017.